Target Marketing is a strategy that focuses your marketing on individuals and businesses who are most likely to buy from you. 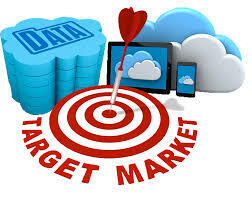 Here are 7 steps for identifying & attacking your Target Market. Target Market Topics: Definition, ID Problem, Current Customers create Profile, Primary, Competition, Research Industry, Track Target. When you find the Niche of your Target Market, you can Focus on Converting your best Prospects !!! A good way to determine who is likely to become your customer is to identify & clarify the problem that your product or service addresses. Every company should aim to solve a problem. Whether that solution is found in a product or service, companies need to know what their item can do to make a customer’s life easier. When you identify your target audience, you can create products, services & marketing materials that better fit their needs. Instead of creating generic items, you can develop super “specific” items – that will get you noticed. Customers will feel like you’re speaking directly to them and their problems, ensuring they will come back for more when they need it. Assessing your current customers and identifying the common characteristics they share – is a great way to learn who else could be a potential customer for you. Understand why your current customers bought from you, assess which customers are your most promising or loyal ones. Now you know the profile of the people who are most likely to become your next customers. This is a good starting point to identify your target audience. To create your ideal client, you’ll want to think about who you would like to do business with if you could select anyone in the world. 3. Do a Profile of your Customer. Listing out the characteristics of your typical customer is a necessary step towards identifying & defining your Target Market. These characteristics need not be personal ones; they can pertain to lifestyle, income earned, disposable income, geographical location, hobbies, and many other things. Take some time to do research on who is coming to your Website and requesting your products or services. Consider your customers’ gender & age group. You may also want to determine the which types of family you’re serving and where they work. If you’re an online business, you’ll also want to work at the location they live. Other factors to consider include how much money they make, education level, & hobbies. You may notice that your loyal customers are already from similar demographics. This is because, without even noticing it, your target audience can naturally gravitate to you and your business. RELATED: Why Should Customers Buy from You? 4. What is your “primary” Target? Many products & services may address the needs of a variety of people, they still have a primary audience. These are the people who: a) gain the most benefits, b) have the greatest need for these services/products, c) have the ability to pay for them & d) buy the biggest quantity of them on a regular basis. Knowing who makes up this primary Audience should be your goal when you are trying to identify your Target Market. Knowing your target audience can help you make better decisions when creating and selling your products. When you know exactly who you’re going to sell to, you can make strategic decisions to catch their attention and make more sales. Examining what your competition is doing, is a great way to get started with your Target Market. While they are already your competitors, you won’t be successful if you try and enter into the exact same space they are already occupying. To get the newest business, you’ll need to “differentiate”. Be unique. Look at every aspect of your demographics that are currently loyal to your competitors, then find a place that they may be ignoring. This may be a certain age group, income level, or gender. Considering what areas your competition are leaving open can be a greatest way to find a Target Market with minimal competition. Keeping track of what the competition is doing is a great idea in more ways than one and it can help you identify your target audience too. If your competitor’s marketing campaign is aimed at a specific customer segment, there is a good chance he has spotted a marketing opportunity there and that he is exploiting this. Keep an eye on your closest competitors’ marketing campaigns, sales spiels, brochures, websites & social media outreaches to understand their target customer base. Your research may turn up industry segments or names of specific customers they are missing – that you should be targeting. 6. Research Industry Publications, Statistics Special Reports . . .
which can provide clues as to the type of customer you should be “targeting” and sometimes how the market might be changing. Such reports may describe the typical customer demographics. One way to find such reports is to search the web for terms like “size of the market for [industry or prouct name]”. Periodically evaluate your Target Market to determine how they are doing and make changes if their needs are changing. Keep up with Tech Trends by always researching what problems they’re looking to solve, so you can always reach your target audience more effectively. Conclusion: “everyone” is not a Target Market. Even if everyone, or everyone in a particular industry should need what you sell, you won’t be able to reach “everyone” on a small business budget. Comments: Do you know any other Steps to Identify & Attack your Target Market? Peter/CXO Wiz4.biz Integrated the following 2 Articles. For complete Article, click on Link. For more Info, click on Target Market.